I heard earlier today that the entity that is attempting to buy theMeridian Clinic in Bosque County is an LLC called Glen Rose Health Partnership. I looked up on the SOS website and wasn't able to find an entity named that-now maybe it was listed some other way or is so new that it's not on the SOS website yet, or maybe I was just BLIND when I was looking for it and it could have bitten me. 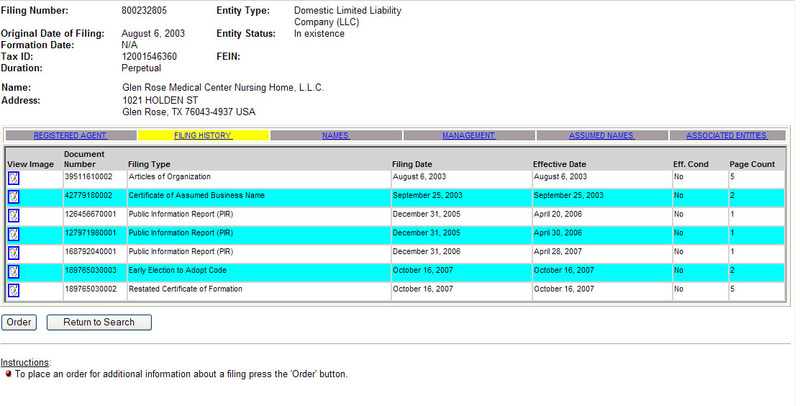 I did find the "Glen Rose Medical Foundation", the "Dr Roger Marks Foundation", the "Glen Rose Medical Center Nursing Home" and the "Glen Rose Healthcare, Inc." I didn't get down any of the filings as, for some reason, I coudln't get the PDFs to display online and it's a buck a search. 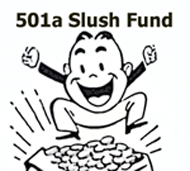 If YOU want to spend a buck and send me the pdf's or a screen dump, I welcome you to. 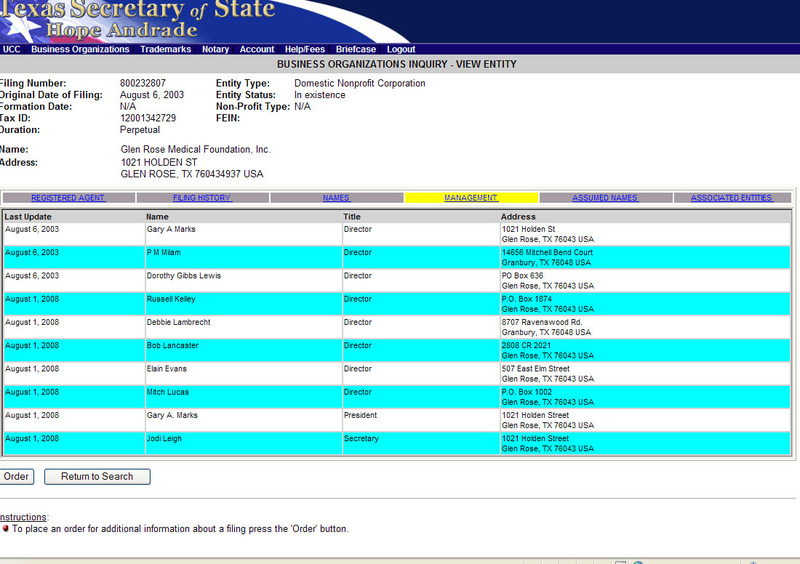 But there is additional information up there in some filings. Meanwhile here's a screen dump of the pages I looked at, with some comments. Before you look at any of the links to screen captures I did from the SOS website, notice anything in common with all these? They all include Gary Marks. Glen Rose Healthcare Inc.-Management. Registered agent is Gary Marks. 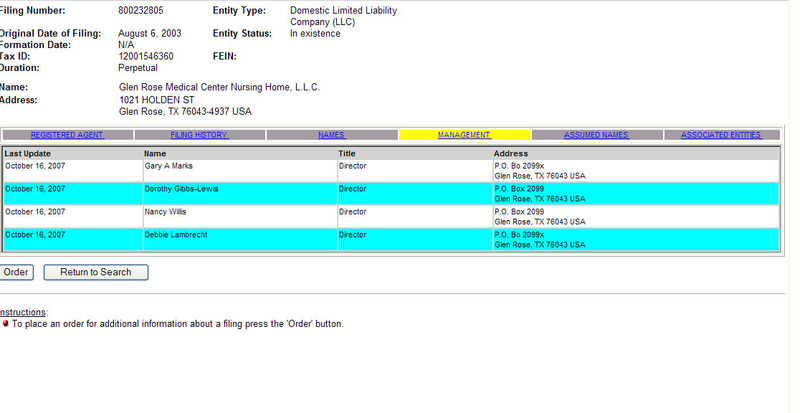 Glen Rose Medical Center Nursing Home LLC Filling INformation. Now I understand that Ms Beck, who wants to buy the clinic in Meridian through the Glen Rose Health Partnership (which I couldn't find on the SOS site) also works for the Nursing Home at the GRMC. WHERE is the money coming from to buy the clinic???? Glen Rose Medical Foundation's DBA is Glen Rose Medical Center. Get that? the Glen Rose Medical Center ****IS***** the Glen Rose Medical Foundation. Somervell County Hospital District Meeting- Tax and IS THE SLUSH FUND GOING TO BE ADDRESSED? What Happened to Josh Pendergraft at Glen Rose Medical Center? Here's my understanding of all this: GRMC is owned by the county. GRMC Foundation works for the county to manage the hospital and nursing home. GRMC wants the creation of the hospital district to generate funds to stay afloat. Meridian: A nursing home development company named Merritt is offering GRMC $150,000 to establish a clinic there in exchange for refurbishing the Meridian NH (at Merritt's expense). 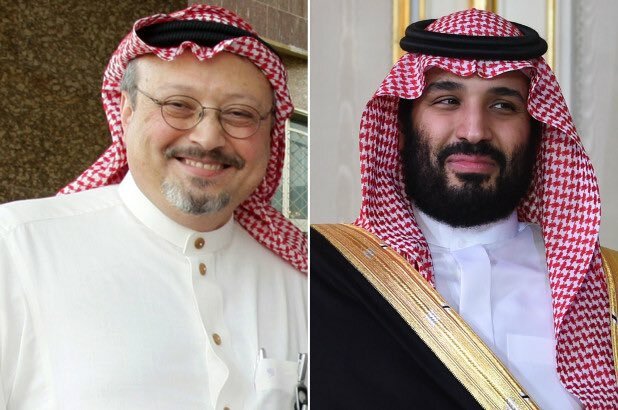 These NH residents I assume could be serviced by the clinic and also GRMC, as well as having some health care services for the local population provided by the clinic. Merritt is also offering to deed GRMC an acre of land. Roger Marks Foundation: privately endowed. Is raising money for the establishment of a pediatric emergency area at GRMC. I have also been told that all salaries, etc, will be open record. 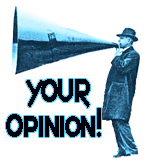 I do believe it is in our interest to support GRMC and keep it local. GRMC is not owned by the county. GRMC is, according to one of the documents on the SOS website above, a DBA for the GRMF. The GRMF aka GRMC is a private entity that leases the land, buildings and equipment for $1.00 per year plus now owns over 14 million to the county through the certificate of obligation. I agree with you that GRMC wants money to stay afloat, just as any private entity might like to stay afloat if they could make their budget contingent on taxes. Interesting about the clinic-I heard a different story, as related in the Bosque County paper. Analogy-I sell you a house and I use the proceeds of what you pay me to furnish the new house you just bought from me. 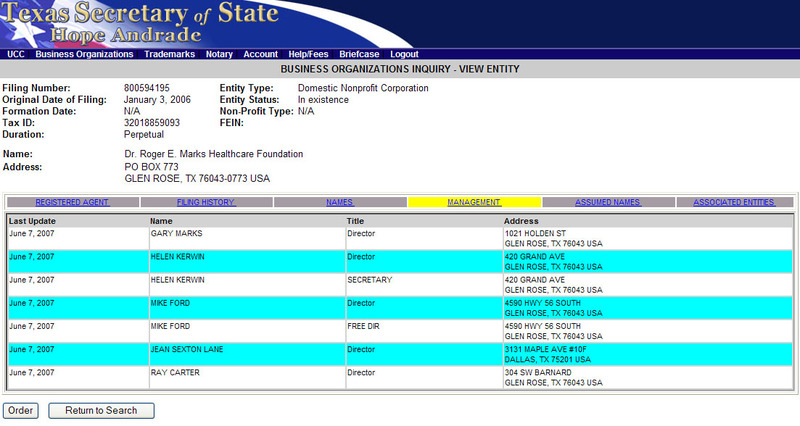 Marks said a private company was buying the clinic-that presumably is the Glen Rose Health Partnership, as described in the Bosque paper, but I can't find that listing on the SOS website. (Might just be me and I missed it). Would like to know that the hospital district would not include funding the clinics. Roger Marks-if, as you say, it's true that one of the purposes of the foundation is to raise money for GRMC, then I think Mike Ford should recuse himself from any votes about the hospital. I don't disagree about having a local hospital but I don't agree with the hospital district. 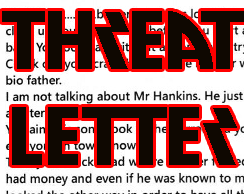 Here's link to the post I did that has the lease agreement in it. I went down the courthouse and looked it up. Glen Rose Medical Foundation dba Glen Rose Medical Center leases the land, building and equipment from Somervell County for one dollar per year. Same thing with the nursing home. GRMC is owned by the county. What does The Roger Marks Foundation have to do with Mike Ford? Click on the picure links, above. Again. 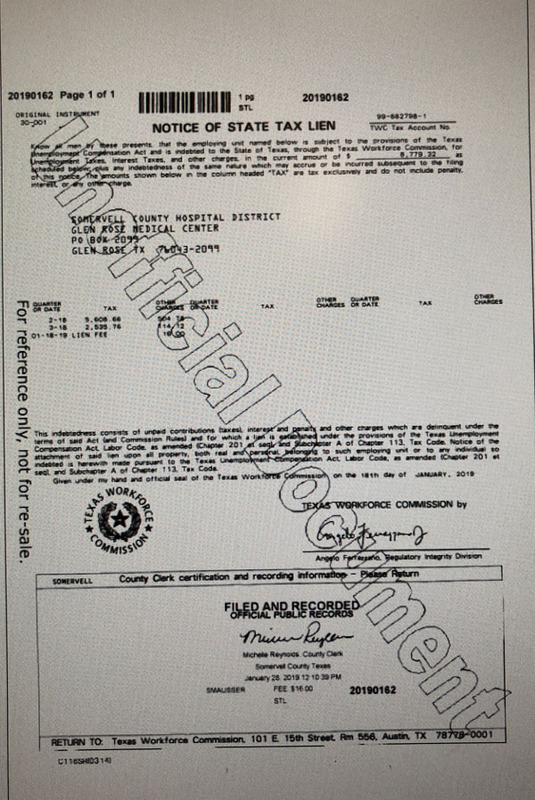 The Glen Rose Medical Center is not owned by the county. GRMC is an entity, a private foundation that leases out the land, building and equipment from the county. Suppose we started the HumanBeing/Salon Medical Foundation, HBSMF, for short. We would go to the county to ask if we could lease their stuff for whatever their terms are. Our decisions about how we ran our foundation, what WE charge for rent, what WE charge for patient procedures, salaries for doctors, nurses, technicians, etc is OUR decision and has nothing to do with the county. Now, on the Roger Marks Foundation. Go look at the link, above. Mike Ford is president of the Dr Roger Marks foundation, one purpose of which you say is to raise money for GRMC-GRMC is the private foundation, as detailed above. I think that is a conflict of interest. One more thing-I think we may agree about this but maybe the naming is what is tripping up. Here's a buliding, the Glen Rose hospital, the shell, that the county owns. It sits on land, has a building and equipment but nobody to run it. Somervell County doesn't want to run it. They want to find somebody to come in and run it as a hospital/clinic. The Glen Rose Medical Foundation, which is a private foundation whose dba is Glen Rose Medical Center arranges, via a lease for $1.00 a year to go in and use the facilities and run it. That's what the lease says. But look at this part of the lease. Whereas, the Foundation believes that it can operate and manage the Hospital so as to provide a continuity of medical services in Somervell County without relying on subsidies or capital expenditures from the County or the Authority. That would be the Somervell County health Care Authority, which was created by the county to overseee and provide for the management and operation of the hospital. Re-reading that again. The lease was entered into with Glen Rose Medical Foundation aka Glen Rose Medical Center because, in part, the Foundation said it could run it without needing any subsidies or capital expenditures from the County. But it couldn't. It borrowed 14.5 million dollars from the county. And now it wants taxes to run it. This particular lease ended on September 30, 2008, but is automatically renewed for another 5 year term, and may even go on a month to month basis.